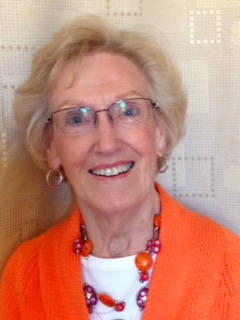 To introduce myself, I am Sarah’s grandmother and Marty’s mother, and I am honored to be included in their blog. I began knitting when I was in my early teens, beginning with a very long stocking cap. Some of you wont even know what that is! You can Google it! Then I began to knit mittens, and graduated into argyle socks for my boyfriends. My husband kept his for too many years. They would not wear out. After my children arrived, I began knitting sweaters, and each of them (all 10) had at least one. I also knitted striped skirts for the girls. One still has hers… guess who, Marty?? 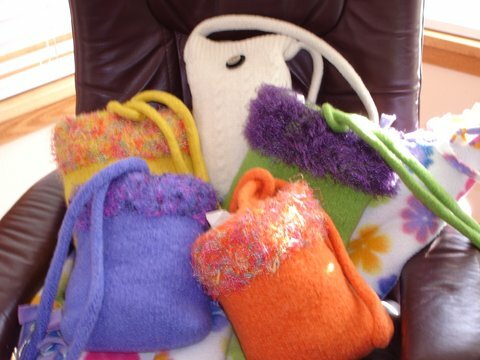 Through the years I have knitted afghans, adult sweaters and hats, felted purses, and now baby items, caps and sweaters, trying to keep the new great-grandchildren supplied. 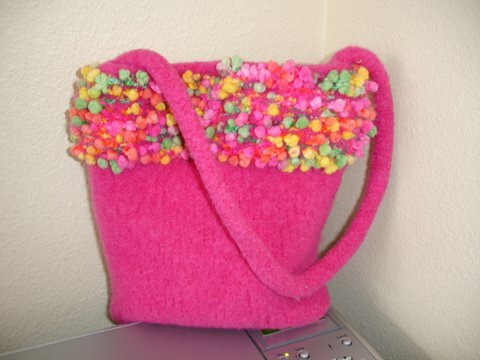 Today I am sharing some of the felted purses I have made. Most of you will not remember the “boiled wool” jackets that were so popular, and quite expensive, a few years back. 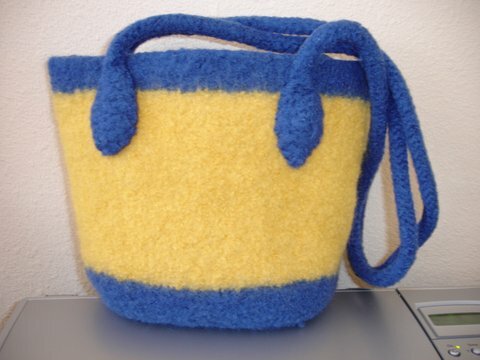 Boiled wool is felted wool. 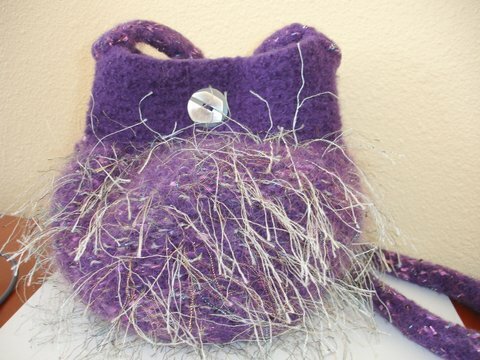 One of the big advantages in making a felted item is that the felting covers up all your little mistakes!! It’s great for a beginner. I will give you some basic tips, but just know that there are some really good books available at any yarn shop, or look online. 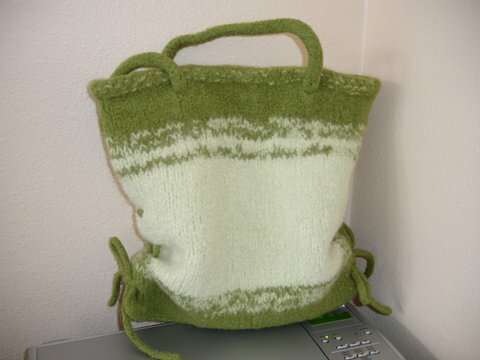 A couple that I have used are “Pursenality Plus” by Eva Wiechmann and “Knit One, Felt Two” by Kathleen Taylor. 1. It is imperative to use 100% wool yarn, not washed or Superwash. One brand I like is Cascade but there are many others. 2. 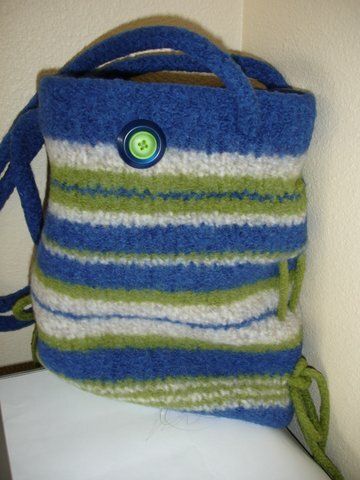 The item will be ‘oversized’ when you begin, and this depends on the size of yarn and the needles. Don’t get discouraged seeing it so large. Just know that it will be shrunk to the desired size when washed and it may need more than one washing. 3. I like to use an old zippered pillow cover to enclose my item for washing, to avoid any lint from escaping. It is also helpful to have another large item, like a pair of jeans, washed with it, as this helps to move the item around. It is not necessary to use a special soap, but some soap is helpful. 4. Do not try to wash your item by hand. It needs the full cycle in a washing machine. Use the hottest water possible. If your washer mixes cold with hot, turn off the cold faucet during the wash cycle. It will be necessary to turn it back on for the rinse. 5. Once your item is washed, use your hands to pull and shape it to the desired size. I placed my bags over flower vases to dry. Try to find a way to allow it to dry as it is shaped. 6. Long straps can be made for your bag by using the I-cord method. Just be sure to make them twice as long and wide as the finished cord. 7. For a beginner, try knitting some coasters, or perhaps a glasses case to begin. Then it will be possible to see how your yarn reacts to the felting. Good luck! On a future date I will give you come tips on lining a bag and attaching a magnetic closure. This is so so so so cool…. Are any of these for sale by chance? ?